If you’ve ever remodeled or redesigned a house, you’re going to relate to this post. If you haven’t, consider this a little peek behind the curtain. You go in thinking everything will just run smoothly, that you will be able to find everything you need and get it when you want it. Alas, the world of home design does not work that way my friends. There are a litany of variables, any of which can trip up your entire design process. Perhaps a trade is unavailable (for the next six months!). Perhaps your dream tile is back ordered (for at least six months). Or perhaps you have a vision that is tough to actualize. 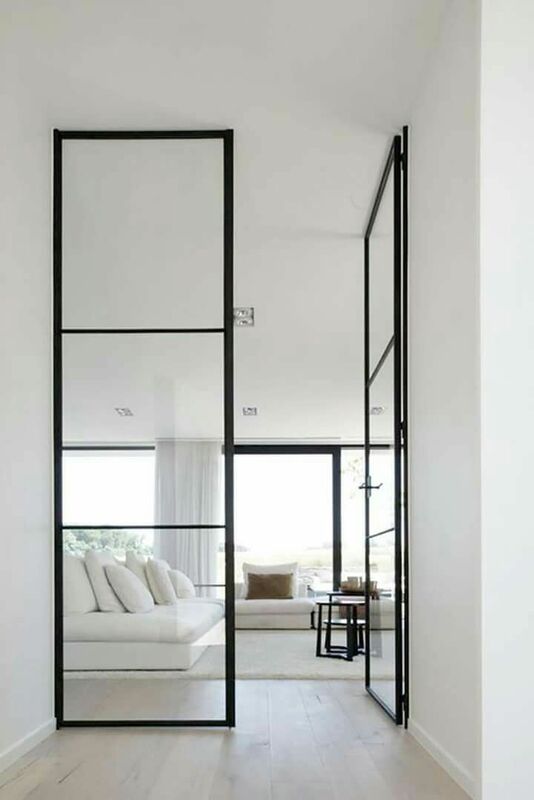 This is the case for one of my favorite design ideas for our house: steel doors. One of the key design features I want in our house is steel doors separating this room from the rest of the communal space. Steel doors are stately. They add such drama. They don’t block light. They’re black. And added bonus, they’ll tuck away our TV so as my kid has movie nights with friends (many years down the road – have you read my thoughts on kids and tech??) us adults can enjoy the living room with the doors closed. That said, actualizing these doors is easier said than done. It’s very hard to find sources for custom work. While I’ve found many a resource if I want some steel doors for my bathroom (this Apartment Therapy story is a good one), but crafting a set of 11.5 ft door has proved to be exceedingly challenging. But look at all this pics. The vision is just too good. This design element must become a piece of our house. So if you happen to have a line on someone who would want to create the prettiest set of doors that you ever did see, I’ll take any and all recommendations! Hello! I don’t know of anyone who makes these, however I follow a DIY blog and she just had some similar doors put in her house. Her name is Mandi and you can find her at vintagerevivals.com. Hopefully she can offer some insight! Try contacting an ironsmith in your area. E.g. I live in New Orleans and there’s a few designers that get custom furniture made here based on their designs. They use New Orleans Iron Works and then get the pieces professionally powdercoated by a second company in matte black before it’s then sent to their upholsterer. The construction would be different than a headboard, but I’m sure it’s possible. Trick is really to think outside of the box in terms of “who” could make you something. Think about the components of the thing you want to create and what companies deal with that material regularly. Love this idea Kirsten. Time to find me an ironsmith! Check out Reilly Windows & Doors – high end steel doors are their specialty. They are amazing – but incredibly expensive. Check out this post on steel doors. Has buying options at the end. Good luck! I hadn’t yet but now I totally will. Hello Erin! What a lovely inspirational post! Hope we are able to inspire you with our work! I need steel doors just like the one that you have for the pantry – can you supply or give me a link to the factory please. By the way I love all of your doors and will look at other designs too. By the way I live in the South of France (Nice).